Sweet, smiling, tasting, thirsty, tired, sneaky, yuk, yum, lick, kiss! 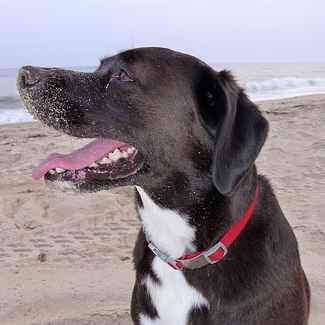 The purpose and personality of a dog’s tongue. Kiss your grandma before you go! 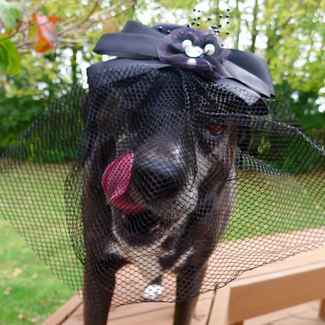 When browsing through all of the pictures of Haley over the years, it’s always her kooky tongue pictures that make me laugh the most. 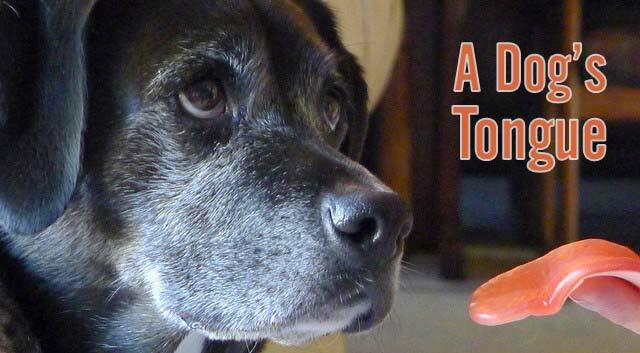 Sometimes it seems like a dog’s tongue has a life of its own. Even though it’s one of my favorite features about Haley, she didn’t feel quite the same way about the human-like, gummy tongues we had around Halloween time last year. ? 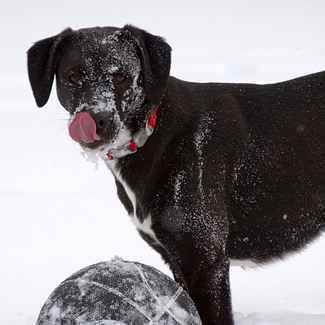 What’s your favorite feature about your dog? 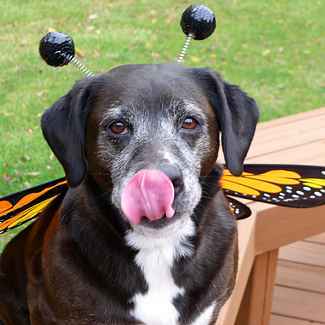 Hahaha, your beautiful fur friend LOVES to stick out his tongue! She sure does, lol! It was so nice to meet you today in the WW blog hop and thanks for stopping by to visit us! Absolutely adorable. Though I’m pretty sure that stone guy is not going to engage in conversation, Haley! My favorite feature on Ruby are her eyes. They are so expressive and sweet. 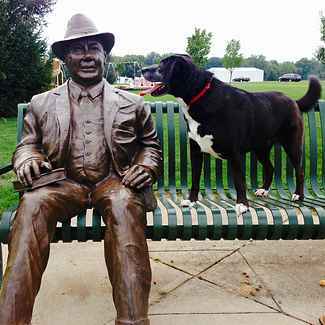 I told her that the stone-faced guy had treats, lol! Ruby does have amazing eyes and such a sweet, expressive face. ? What a cute post idea! My little sis Bailie is the one with the funny and super long tongue around here. 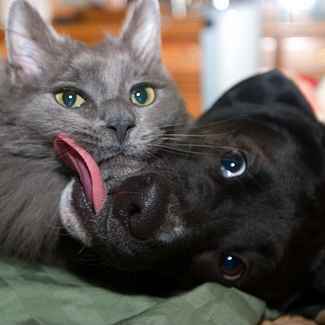 Love the one sneaking a kiss to the cat! Thanks, Emma! We’ll have to get a contest going between Haley and Bailie, haha! ? Thank you, Spencer. Have a great Wordless Wednesday! I absolutely LOVE this post!! Fabulous and fun pics!! Happy Wednesday! Ah, thanks so much, Jeanne! ? Wow, what a tongue! My favorite thing on Hershey is the little spot of brown on her otherwise white chest. On Graham it’s his ludicrous ears, and on Marsha it’s her oversized enthusiasm. Great features on Hershey and Graham, but I love that enthusiasm for Marsha! These are fantastic photos, and I love your poetic captions – so clever!! Thanks, Cathy! I’ve been wanting to do this tongue post of Haley for a long time. Haha! I’ve known some old men that do that too. ? My fave feature on Rita is the super soft hair right behind her ears. Love to rub that spot. Aw, I bet Rita loves that too. ? Love the pictures. 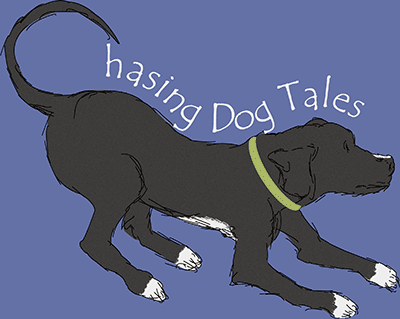 They tell the story of a dog with a full life and a very large tongue. Lol! That describes Haley perfectly. ? Oh I love Haley so much! 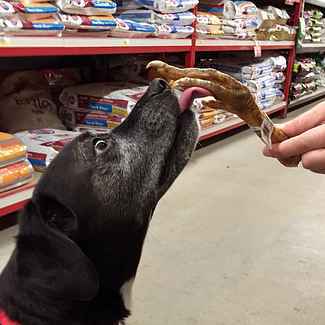 Tasting a turkey leg at the store looks like a special treat! It’s so fun to go back through pics… I did this a little over the weekend. Thanks, Christine! It is a lot of fun looking through the old photos and remembering all the crazy antics and good times. Those are hilarious! 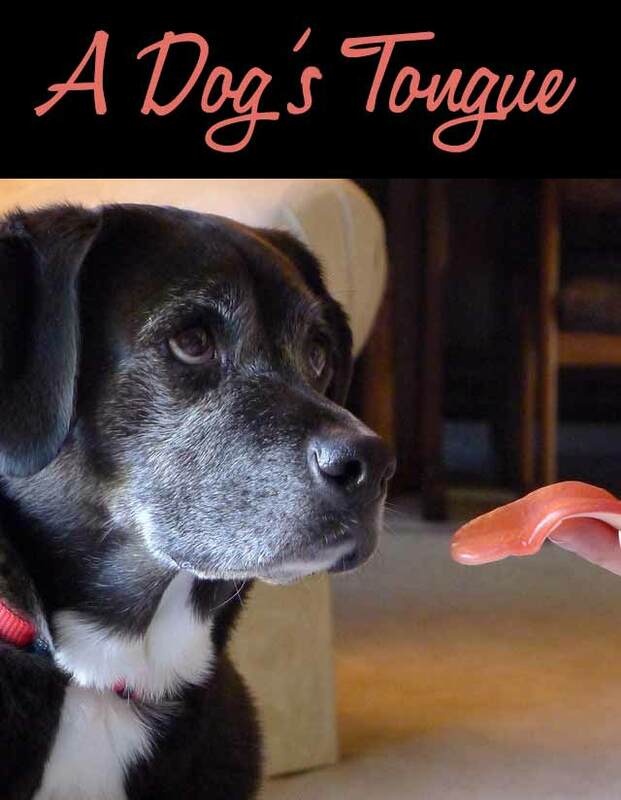 Liam has a pretty darn long tongue, too (and it makes an appearance in my Wordless Wednesday hop post, too!). 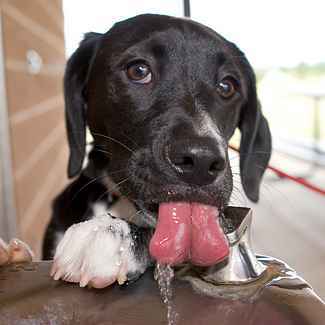 I saw that, and what a wonderful and helpful article about watching out for our pups when they might be thirsty or overheated. ?? Tongues out really do make great photos! Haley’s are exceptionally adorable. Thanks so much, Cathy! You’ve got twice the adorable tongues at your place, haha. ? Those are priceless, but I especially love the water fountain. ♥ It would be impossible for me to choose Bentley’s favorite part. LOL! Thank you, M.K.? I think the water fountain pic is probably my favorite too! Very cute – love it. 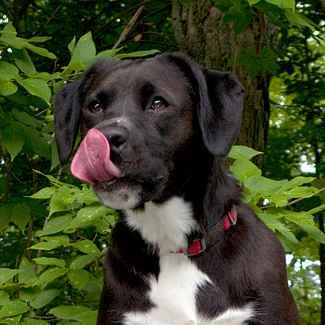 I use my tongue to swipe a lick of vanilla ice cream! Yum! Time to head to Starbucks or McDonalds for a kiddy cone. Haley says the “kiddy cone” is not to be confused with a “kitty cone”, lol! I love the picture licking the cat! That one is a total sneak attack. I have a few good pics of Archer’s tongue in the middle of a yawn. I’d love to see those, Colby! Do you have an Instagram yet? I didn’t see a link on your website, but let me know and I’ll check it out. That one picture is a long tongue…lol. 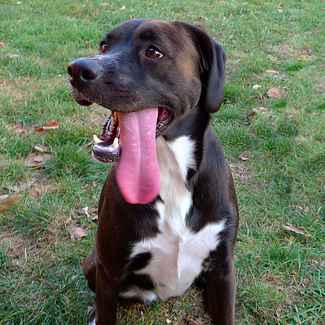 Maybe we’ll host a contest one day for longest dog tongue without Photoshop edits, lol! ? These were just too cute! Haley is such a sweet girl. Love the one drinking and then tired!! Thanks, Julie! We’ve got some crazy and funny pups, don’t we? ? Haha! They’re kind of gross but they seem to be a hit with the pups. I can only find them at our local Rural King store and the cashiers always hate to ring them up because they have to touch them to scan them, lol! ?